Tests across the city on youtiao found high levels of aluminum, plasticizer, saturated fatty acid, and the use of poor-quality cooking oil, the Shanghai Consumer Council said. Five unlicensed restaurants that sold youtiao, or deep-fried dough sticks, were closed as tests across the city on the popular breakfast food found high levels of aluminum, plasticizer, saturated fatty acid, and the use of poor-quality cooking oil, the Shanghai Consumer Council said yesterday. The council said it tested 29 samples of youtiao from 25 food brands, but it did not say when the tests were conducted. Plasticizer, chemical additives that promote plasticity, was found in the youtiao served at two McDonald's outlets, while a sample of a youtiao served at a KFC outlet was found to have the highest amount of saturated fatty acid of the 29 samples tested, which could cause obesity. At the Sida Jingang eatery on Chengshan Road in the Pudong New Area, one of its youtiao was found to have an aluminum concentration of 980 milligrams per kilogram — far exceeding the maximum amount of less than 100 milligrams per kilogram for aluminum food additives under China’s food standard. The aluminum mainly comes from alum, which is widely used as a food additive. It is used in some youtiao recipes as the leavening agent instead of baking powder. However, long-term and excessive intake of aluminum could damage the nervous system, hurt reproduction, and cause rickets and osteoporosis, said the Shanghai Food and Drug Administration. In all, 11 restaurants — including Taoyuan Village and Yonghe King — which claimed that their youtiao had not been made with alum additives were found to have produced youtiao with 6.1 milligrams per kilogram of alum on average. That compares with 6.36 milligrams per kilogram at restaurants which did not claim that their food was free of alum. Food made at the Changyang Road outlet and Xingguo Road outlet of popular Chinese fast-food chain Xinya Dabao were respectively found to have 43 percent and 39.6 percent of polar components, compared with the maximum national standard of 27 percent. Polar component is an index that signifies the quality of cooking oil and whether the cooking oil used to fry youtiao was frequently used, according to Cao Huliang, a food nutrition expert. Although Xinya Dabao insisted that its restaurants had been changing their cooking oil daily, the Shanghai Consumer Council said the index should not have been higher than 15 percent if the cooking oil had been changed every day. Food made by seven food brands — such as Husiye, Dialaixi and A Wen — were also found to have higher polar components than China’s food standard. Eating food with high polar components could cause cancer and result in high levels of cholesterol. Of 29 tested food samples, nine samples — including those served by the Kongjiang Road outlet of KFC, the Daning Road outlet of Yon Ho, and the Kongjiang Road outlet of Yonghe King — were found to have a higher amount of saturated fatty acid than the average of 3.551 grams per 100 kilograms. A youtiao served at the Kongjiang Road outlet of KFC contained 6.81 grams of saturated fatty acid per 100 grams, which is equal to the amount of saturated fatty acid in 21 grams of fat meat. “If people have such one youtiao as breakfast, they should control the intake of saturated fatty acid for other meals,” said Guo Hongwei, a professor of public health at Fudan University. The youtiao served at three restaurants, including the Kongjiang outlet and Changyang Road outlet of McDonald’s, were found to have diethylhexyl phthalate (DEHP), a plasticizer. The amount of DEHP found in the youtiao at the Kongjiang outlet was 1.35mg/kg, near the Chinese health limit of 1.5mg/kg. McDonald’s said it did not know why its youtiao had DEHP and said it would investigate the matter. 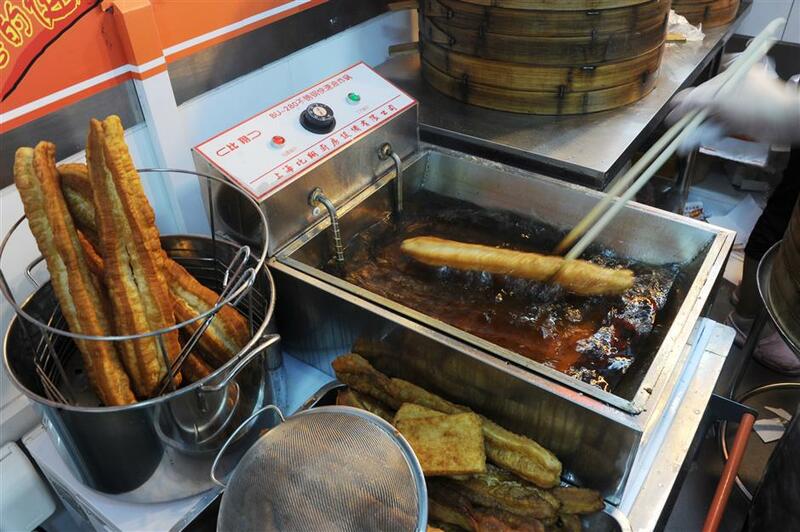 Five unlicensed restaurants serving youtiao — Sidajingang, Lishifu, Zhangji, Husiye and A Wen — had been closed by the Shanghai Food and Drug Administration following the tests. The other three popular breakfast food are dabing (Chinese pancakes), doujiang (soybean milk) and cifantuan (steamed sticky rice balls). "I like youtiao and I ate the food since my childhood, and the amount of aluminum and whether the cooking oil is changed frequently is my biggest concern," said Chen Guoshu, a Shanghai resident who enjoys youtiao two to three times a week.